Established in 2006 in China and with more than 300 people working for it, TIBOX integrates development, production, engineering and trade in a symbiotic whole. The catalog of the brand includes a variety of electrical applicances, metal cabinets, wall mount enclosures, floor stand cabinets, network cabinets, bus junction boxes, plastic enclosures, waterproof and dustproof plastic junction box, plastic sealed boxes etc. The company is constantly improving its producing capacities and currently owns advanced Germany laser cutting equipment, CNC machines, multi-function stamping molding equipment, sealing devices, etc. TIBOX products are sold successfully in Southeast Asia, Europe, USA and other countries and regions worldwide. The company is IS0002-certified -System for quality management and own certificates such as ROHS, TUV, UL, NEMA -4X, CE, etc., therefore can offers its customers uncompromising quality and modern design. Vikiwat Ltd. is a direct importer and an authorized distributor of a wide range of TIBOX products. As a wholesaler, we offer flexible price conditions and in stock QTY for a wide range of metal enclosures, metal cabinets, wall mount enclosures, floor stand cabinets, network cabinets, bus junction boxes, plastic enclosures, waterproof and dustproof plastic junction box, plastic sealed boxes etc. with quick delivery. Switch box LV1414, 140x140x75mm, IP66 Switch box with dimensions 280 x 190 x 130 mm and degree of proteciton IP67. The switch box is made from thick PVC material with insulation and have a hole with plastic cover. 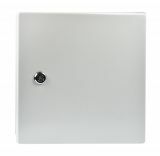 Switch box TJ-AGX-3819, 380x190x150mm, IP67, waterproof, PVC, white color Switch box with dimensions 380 x 190 x 150 mm and degree of proteciton IP67. The switch box is made from thick PVC material with insulation and have a hole with plastic cover. Switch box TJ-AGX-2819, 280x190x130mm, IP67, waterproof, PVC Switch box with dimensions 280 x 190 x 130 mm and degree of proteciton IP67. The switch box is made from thick PVC material with insulation and have a hole with plastic cover. Switch board LV1616-1, 160x160x90mm, IP66 Switch board with dimensions 160x160x90mm and degree of protection IP66. Switch box ST5 625, 600x500x250mm, IP66 Switch box ST5 625 with dimensions 600 x 500 x 250 mm and degree of protection IP66. List Price 4.10лв. VAT Incl. 3.89лв. VAT Incl. 3.69лв. VAT Incl. 3.48лв. VAT Incl.